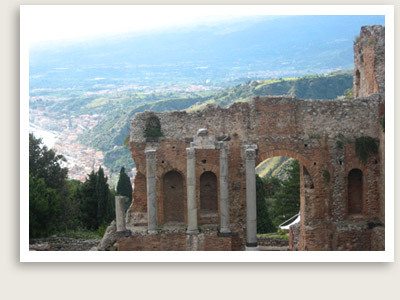 Taormina & Mount Etna Tours Include: Our private tours of Mt. Etna and Taormina, include private transportation with English speaking tour guide, taxes, parking. Not Included: Entrance fees to Greek theater in Taormina, cost of wine tasting and lunch. Departure Points: Catania, Taormina and surrounding areas. Also our private tours of Mount Etna and Taormina are offered as Sicily shore excursions from Messina’s port (9-hour private tours). Other Departure Points Available. Enjoy one of our most rewarding private tours from Taormina, Catania or Messina, Sicily and book our private tours of Mount Etna and Taormina. Mt. Etna is one of the world’s most active volcanoes — and one of the most beautiful and dramatic destinations in Sicily. 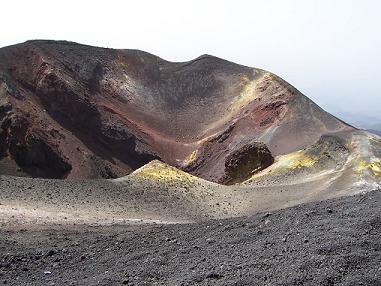 The 11,000-foot-high volcano has more than 400 craters, spread out all over Catania county. Your guided tour of Mount Etna will take you through several Sicilian towns: Santa Venerina, Zafferana and Milo, and visit some old lava flows as we go up this volcano. You’ll tour Mt. Etna’s beautiful towns, situated on a rocky plateau as you head up the volcano, you will see the vegetation transform. At 7,000 feet, you will take a walk and visit the “Silvestri” craters, formed some 20 years ago, as well as the latest lava flows and craters from 2001, 2002, 2003. On the way down, you will pass through a fragrant pine tree forest before arriving in Taormina. You’ll tour this beautiful town, situated on a rocky plateau of the steep Monte Tauro, which dominates the Ionian coast, with Etna rising majestically in the background. Downtown Taormina represents a variety of historical periods, from early Greek and Roman settlements, to Byzantine and Medieval remains, up to 15th-century Catalan buildings and 17th-century Baroque churches. You can stroll Taormina’s main street, Corso Umberto, with its art and designer shops, Baroque churches and Palazzos, and get a glimpse of the breathtaking Greek theater facing the sea. Your tour guide in Taormina will make suggestions where you can have an excellent meal or we can pre-arrange a meal for you to be included in the tour.